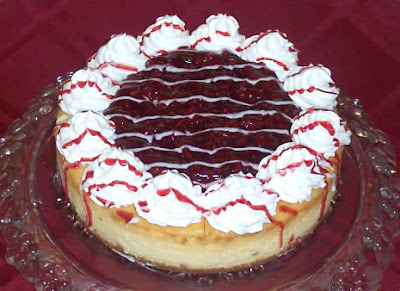 How about making your own tempting White Chocolate Raspberry Cheesecake at home? You can actually make one with our tried and tested White Chocolate Raspberry Cheesecake recipe. This easy recipe will make the Valentine Day special with its tempting and delicious chocolaty taste. · Mix cookie crumbs, 3 tablespoons sugar and melted butter in a bowl. · Place the mixture in the bottom of a 9-inch springform pan. · Combine raspberries, 2 tablespoons sugar, cornstarch and water. Boil the mixture for 5 minutes or until the sauce is thick. Strain the sauce through a mesh strainer to remove seeds. · Now, preheat the oven at 325 degrees Celsius. · Take a double boiler and melt white chocolate chips with half-and-half while stirring occasionally until it is smooth. · Take a large bowl and mix cream cheese, 1/ 2 cup sugar until smooth. Now, beat in eggs one by one. · Add vanilla and melted white chocolate. Pour half of the batter over the crust. Sprinkle 3 tablespoons of raspberry sauce over the batter. · Pour the remaining sauce over the top and swirl the batter with the tip of a knife creating a marbled effect. · Bake the mixture for 55 minutes or until the filling is set. · Cool and cover with plastic wrap and refrigerate for at least 8 hours before removing from pan. · Serve chilled with raspberry sauce.